Honesty / Integrity - we deliver exactly what we promise; no gimmicks, no come-ons. Uncompromising Service - we'll be there when your plane arrives. If it's hours late, we'll know and we will still be there. 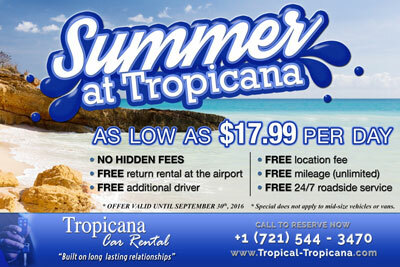 We also provide complimentary 24 hour road service on both sides of the island. Fair Rates - we never add fictitious "airport fees" or "parking fees" or "pickup fees" or "gas taxes" to our rates. The rate we quote is the rate you pay -- no surprises. Well-Maintained Cars - we meticulously maintain our cars to give you a trouble-free rental experience. JMB Website Supporters Members (from the Everything St. Maarten Website) DISCOUNT: $15 off first week rental…PLUS $5 OFF second week rental. Bakers Suites Customers: Once you've stayed at our Bakers Suites, you're entitled to a 10% discount on your rental. Special Monthly Rates are also available.